Safe is an average action film that has some cleverly written dialogue and unique plot elements that set it slightly above other films in the genre. Jason Statham has done one thing extremely well – declaring himself as the go-to action superstar of the decade. Film after film he consistently takes on roles that share similar commonalities in both personality and career choice. He’s the baddest good guy that walks a blurry line and has a set of morals that sets him apart from his evil cohorts. Statham’s newest film Safe doesn’t do anything to help move him away from the persona he’s been type-cast with but it does allow him to take on a character that is smartly written and well executed. Statham plays Luke Wright, an ex-cop turned cage fighter that decided not to throw a fight and ended up on the wrong side of bed with the Russian mob. In order to get their point across they take away the one thing he loves most – his wife. A year or so later, he crosses paths with Mei (Catherine Chan), an eleven year old Chinese girl taken away from her ill mother after the Triad finds out about her gift for memorizing numbers. When Wright decides that he’s had enough with life, he finds a reason to live – to protect Mei. Mei holds information in her head that both the Russians need and that the Triad wants back. The only thing standing in the way of her becoming a casualty of the war that has sprung up between the two factions is Wright. He doesn’t look like much at first, but he sure cleans up nicely. Wright pulls out all the stops to rescue Mei from the clutches of well, everyone. And I do mean everyone. Not only does Wright need to fight off the Triad and Russian mob but as he delves deeper into the war between the two, he comes across crooked policemen and politicians, who don’t make things any easier. While the film is quite short, a steady momentum keeps things going at a pace that won’t leave you bored. Besides the action, the relationship that develops on screen between the unlikely duo of Luke and Mei softens the movie quite a bit. The blood and violence that come with any Jason Statham flick takes on a different tone in scenes with the two characters. We get to see another side of the actor that we don’t see often and it’s a welcome change. In addition to the main characters, the supporting cast lends something special to this otherwise run of the mill action thriller. Robert John Burke, who plays Captain Wolf, stands out in the colourful cast of supporting characters. He offers up an engaging screen presence and is able to hold his own while on screen with Statham. Safe is an average action film that has some cleverly written dialogue and unique plot elements that set it slightly above other films in the genre. 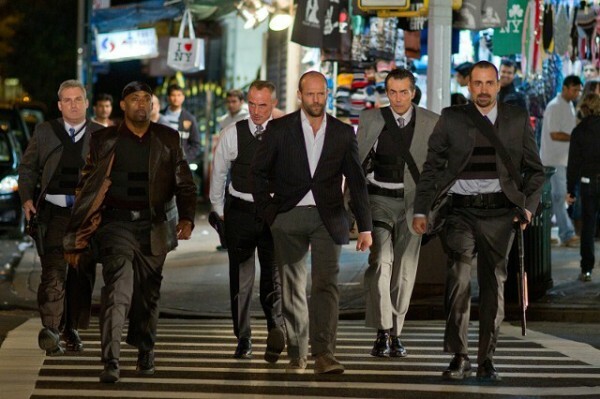 For Statham, who has been playing pretty much the same role for the last decade, this part brings him full circle, right back to The Transporter series, mainly the second one. For a film that was prominently marketed as “from the producers of Kill Bill and Inglorious Basterds” Safe was a let down. That being said, on its own merits, the film didn’t completely miss the mark. As an action/thriller Safe gives you about an hour and a half of well executed action sequences and meritless fun. At the very least it’s a nice chunk of escapism. It also doesn’t hurt that the film starts with Statham sans shirt.